The jobs outlook improved once again in February as both new employment and the overall labor force rose for the third straight month. Employers added over a quarter of a million private sector jobs, beating conservative Wall Streetestimates that called for a 210,000 increase. Private-sector employment grew by 233,000 jobs, 227,000 of which consist of nonfarm payroll employment. Employment rose in professional and businesses services (+82,000) with temp services accounting for just over half that figure at 45,000. Health care and social assistance also posted gains (+61,000), as did leisure and hospitality (+44,000), and manufacturing industries (+31,000). The unemployment rate is holding steady at 8.3 percent after falling in recent months. The long-term unemployment numbers, tracking those who have been jobless for 27 weeks or more, fell slightly from 5.5 million to 5.4 million. The long-term unemployed account for over 42% of the total unemployment figure. One of the most promising indicators lies within the U-6 rate, which declined to 14.9 percent, the lowest reading in more than three years. Often referred to as the “underemployment rate”, the U-6 rate doesn’t just measure the percentage of people in the U.S. that are unemployed — the figure most often quoted in the media, which is sometimes called the U-3 rate — it also tracks two other very important groups. The U-6 rate also accounts for those who are marginally attached to the work force — unemployed people who, for whatever reason, have not looked for work in the 4 weeks prior to the survey, whether due to school attendance, family responsibilities, or because they simply gave up looking for work. It also tracks those who would prefer full-time employment, but due to economic circumstances are working part-time jobs instead. 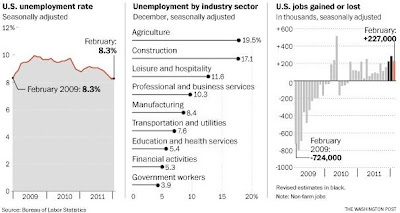 Another interesting point lies within the December and January job numbers, which were both recently revised. 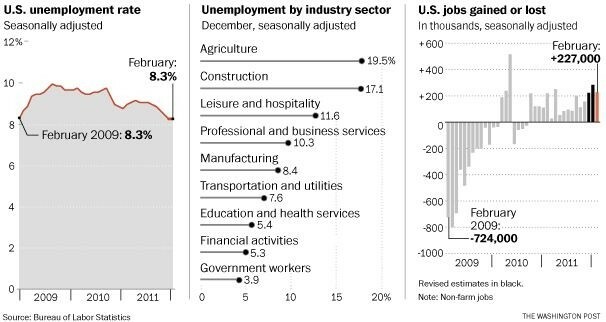 December’s final job tally rose from 203,000 additional jobs to 223,000, a 20,000 job difference. January’s results were even more drastic, going from 243,000 estimated jobs to 284,000. So overall, an additional 60,000 jobs that were not initially counted have now been added to the totals, making February’s increases that much more significant.